New York-based artist Shari Mendelson interprets ancient glass using the most modern of materials: throwaway plastic bottles. 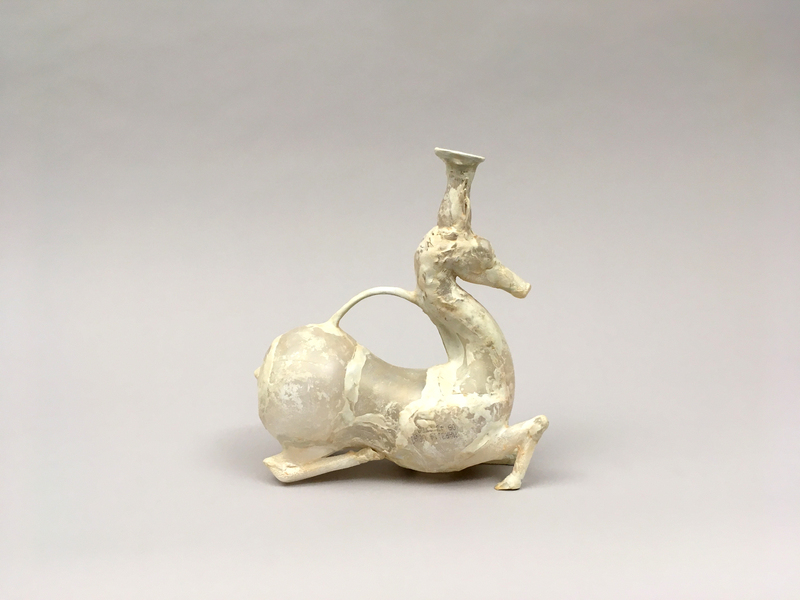 The artist’s vessel and animal forms are glasslike inventions, but they hew close to their early antecedents—a result of Mendelson’s deep fascination and careful study of the field. Glasslike, a solo exhibition, will explore the artist’s current body of work in context with its key source, ancient glass. Mendelson’s approach is like a child’s game of telephone. The artist begins with containers – Pom-Wonderful™, V8™, Sierra Mist™ – which she carefully repurposes. Her vases, urns, amphoras, and animals are embellished with everything from glitter, to powdered mica (meant for eye make-up), to tea bags. The resulting objects are as mysterious as they are mesmerizing. Archeological in feel, “sell-by” dates and impressed logos reveal their contemporary origins. In recent years Mendelson has extended her work into glass. Not a glassblower herself, a 2014 residency at UrbanGlass led the artist to collaborate with technicians to remake her vessels into the medium. Mendelson has continued with several museum-based residencies since, where she has worked with gaffers to create new work responsive to each institution’s ancient glass collection. Glasslike will consider the layers of translation inherent to Mendelson’s work reflecting on material value, historical interpretation, and the role objects can play in the past’s relationship to the present. Shari Mendelson (b. 1961) is an artist based in Brooklyn and upstate NY. Her work has been shown nationally and internationally including solo exhibitions at Todd Merrill Studio in Manhattan, Pierogi Gallery in Brooklyn, and John Davis Gallery in Hudson, New York. Among other recognitions, the artist has received four New York Foundation for the Arts Fellowships, and is a 2017 Guggenheim Fellowship recipient. Mendelson received her MFA from SUNY New Paltz in 1986 and is currently a lecturer at Parsons School of Design in Manhattan. Elizabeth Essner is an independent curator, writer, and researcher based in Brooklyn, New York. Recently a Curatorial Fellow with the Center for Craft, Creativity & Design, she is currently curating exhibitions for The Aldrich Contemporary Art Museum, Arizona State University Museum Ceramics Research Center, and UrbanGlass. Elizabeth serves as a researcher for two upcoming publications on contemporary jewelry and ceramics and has written for magazines including Modern and Metalsmith. She has also been an auction house specialist and an appraiser. Elizabeth received her MA from the Bard Graduate Center: Decorative Arts, Design History, and Material Culture.